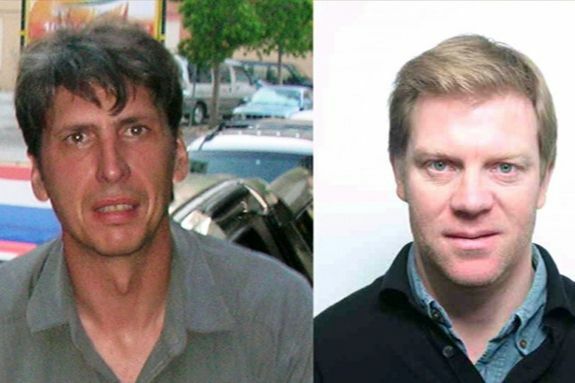 Wednesday June 29th 2011, Herve and Stephane Held captive by the Taliban, 18 months ago arrived in France, free. Oct 21, 2010. Herve and Stephane are detained for 296 days . In Paris their friends and support committee are organizing a Concert at the Zenith Auditorium, with the participation of more than 30 artists. This event will be reported live on FR3 at 8:30 PM, at pick hours. Herve and Stephane were reporting in Afghanistan for FR3 public network (France Television), as such they have the status of State employees. After eight months in detention, Hervé Ghesquière and Stéphane Taponier, journalists on assignment for public TV network, FR3, are still held hostage by Taliban, along with their Afghan guides. Negotiation for their release appears stalled, and French authorities provide little information about the case. According to two of their pals and colleagues in today’s “Le Monde“, President Sarkozy is not rushing to take effective action toward a resolution. Another FR3 source reveals that, during the first few months of their disappearance it was prohibited to broadcast their pictures and names. Newsrooms were told to stay silent about the case (to further negotiations). Meanwhile, more than one French politician denigrated the pair publicly, alleging: excessive taxpayer expense, irresponsibility in war coverage, etc. ” It’s as though they were accused of doing their job,” said a friend anonymously.” This contrasts sharply with the extensive media campaign that helped return Ingrid Betancourt, the Hungarian nurses and Florence Cassez home,” wrote their peers. One can question the disparity, though the general assumption that Herve and Stephane are little-known and therefore unworthy, seems cynical. Some insiders are thinking differently. In France, public media is exclusively government-funded. At the time of their kidnapping, political tension between Nicolas Sarkozy and FR3 CEO Patrick de Carolis peaked. Ongoing antagonism of FR3 by the administration may yet play a role in their plight. Current reports indicate that the terms of their freedom include ransom and release of NATO prisoners in Afghanistan. Throughout France, posters bearing pictures of the two journalists are posted, and public meetings to promote awareness are organized. Twitter site “onvousoubliepas” and “liberezles.net” aim to keep them from being forgotten. “Hope of an happy ending remains, and in the meantime the situation seems to go in slow motion”, concludes our source.